“The overall pipeline project will improve overall safety to the public and to the environment by reducing crude oil shipped by truck and by rail,” Henderson wrote. 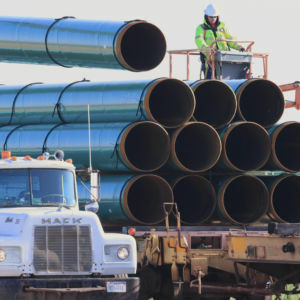 Henderson also rebutted the argument that the company constructing the pipeline had not fulfilled its legal requirements to coordinate construction plans with the Standing Rock tribe. “The proposed DAPL crossing at Lake Oahe is not on reservation lands; therefore, by policy, there is no requirement to coordinate with any federally-recognized tribe,” he wrote. Despite this policy, the Corps attempted to work with the tribe in excess of what was legally required. Henderson’s memo explains that the project once again met legal requirements to gain the easement necessary to finish construction and implies that the project was slated for approval towards the end of the year. Instead, then-Assistant Secretary of the Army Jo Ellen Darcy announced an additional environmental impact study in order to further delay construction. Supporters of construction believe that the memo points to political stonewalling of the project. “This memo demonstrates that the Army Corps of Engineers worked diligently – and in accordance with the law – to ensure the Dakota Access Pipeline was sited and constructed in the most environmentally and culturally sensitive manner possible; and that the Corps, in its authority was about to issue the final easement for Lake Oahe,” said Craig Stevens, spokesman for the MAIN Coalition, which supports new infrastructure development.